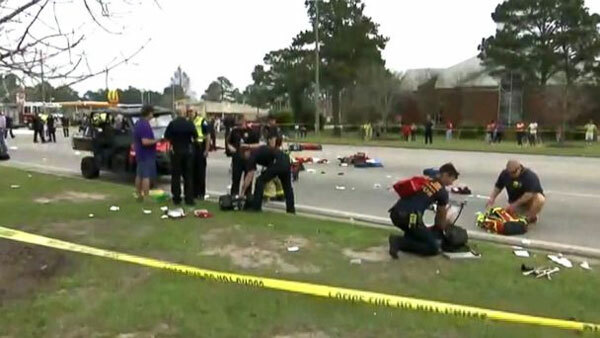 Police in the Alabama beach town of Gulf Shores say a car participating in the city's Fat Tuesday parade accidentally plowed into a band, leaving three young people in critical condition and eight others with less-severe injuries. City spokesman Grant Brown tells The Associated Press that the band had just entered the parade route Tuesday morning when a car behind the group lurched forward into the group. Brown says the vehicle struck multiple people, injuring 11 in all. Details on the most severe injuries weren't immediately available. Brown says there is no indication the crash was anything other than what he calls a "horrific accident." Brown says he's not sure whether the band was from a school in Gulf Shores or elsewhere. Video and photos from the scene show emergency workers helping the injured on the main highway running toward the beach.